« Have You Got the Summer Blues? Queen Anne’s Lace, Daucus carota was one of the first flowers I could name. I did not know it was also called wild carrot, but that name is understandable if you pull up some of the root and inhale that carrot-y fragrance. Who was Queen Anne? Probably, she was Queen Anne (1665-1714) who ruled Great Britain for 12 years. The tiny red flower in the center of the umbel is considered to be a drop of blood when Queen Anne pricked her finger while making the lace. That color of that single red flower is caused by anthrocyanin which attracts insects. 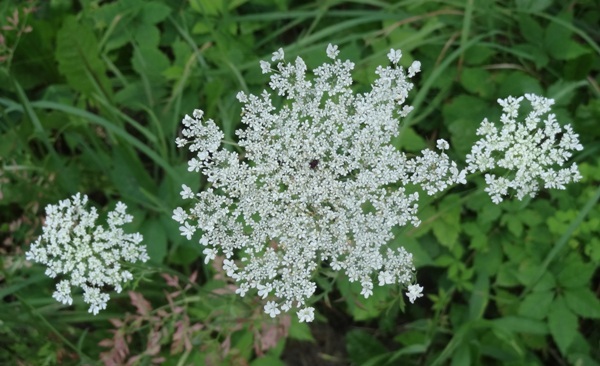 Queen Anne’s Lace is a biennial plant. which is just a rosette of basal leaves the first year while it develops that carrot-y tap root, and it blooms the second year. The flower is an umbel, which is a “flat-topped or rounded flower cluster in which the individual flower stalks arise from about the same point, as in the geranium, milkweed, onion, and chive.” The outer florets bloom first, bloom moving in towards the center which means that a flower can be in bloom as long as 50 days. 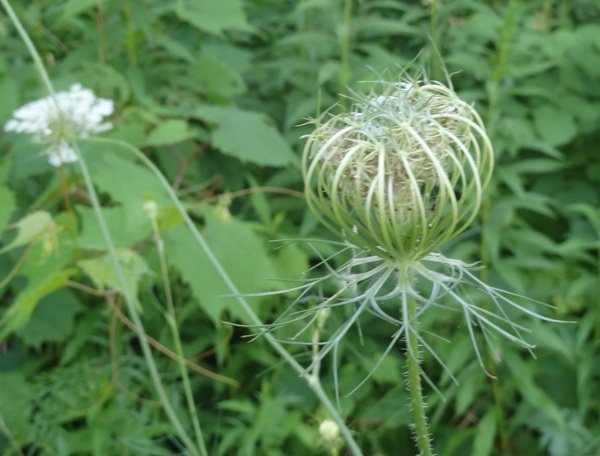 I didn’t actually like Queen Anne’s Lace much as a child, because somehow I usually only noticed it when it was looking like a birds nest, another name it has carried. Now, even though it is not native to North America I love to see it adorning the roadsides, not a fragile bit of lace, but a sturdy flower that attracts insects and gives me great pleasure.